Laurens of Card Buzz was curious about my street vendor's setup. I found him on Google Street View so I'll show it here. As you can see it's mostly one folding table, with wax boxes in the back, and individual cards in plastic for $1, $2 or $3 in the front, mostly star cards from New York teams. There are other boxes under the table like the big box I was pulling cards from on Friday. If you are ever visiting New York on a weekday in nice weather, he's on 37th Street and Broadway, on the eastern side of the intersection (sometimes he crosses the street so check both sides. It's just a couple of block from Times Square so easy to find if you are from out of town. That's Al, the vendor, with his back to the camera. Outfielder Dwight Taylor played eleven seasons of professional baseball, mostly in the Indians and Royals organizations. His best season was 1983, when he hit .302 with 8 HR, 38 RBI and 95 SB for Buffalo. He briefly played in the major leagues for the Royals in 1986, scoring a run as a pinch-runner to help beat Boston in his first big league game. Overall in 11 minor league seasons he hit .264 with 21 HR, 274 RBI and 437 SB. He kindly answered my questions about baseball cards. "I was an outfielder, but on one of my baseball cards I decided to take a funny photo with catching shin-guards on. There are a couple of cards I probably favor more than others. I do not collect baseball cards, and yes I do have some cards of other players." A while back I acquired a collection that was very heavy in Mets cards. 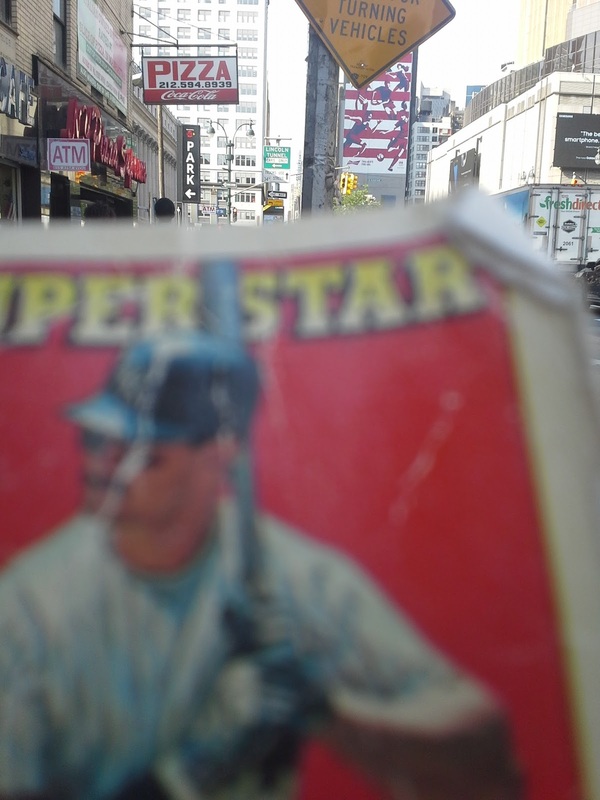 I asked Al, the baseball card street vendor, if he could use any. The only ones he was interested in were cards of the 1986 Mets. This worked out great for me - there's not much interest in a 1988 Donruss Mookie Wilson on the blogosphere, but he can sell it for a dollar to a casual, nostalgic fan passing by. I gave him a 600-count box filled mostly with Mets junk wax, plus a handful of Yankees, highlighted by a Topps Derek Jeter rookie card that is probably $5 tops online but he was confident he could get $15 for. In return I pulled about 100 cards, mostly Yankees and random stars but also just some random cards he had bagged together as well. Lots of 2014 and 2015 Bowman, many of which were nice and shiny. The opposite of shiny, but I liked how the very simple print, that looked like it could have been done on a typewriter, gave this card a real vintage oddball feel. Great photo of a pensive Bernie Williams. In the early days of interleague the Yankees and Mets only played one series a year. The Yankees only played one day game at Shea Stadium in 1998 and I was at the game, so I am always interested to pick up 1999 cars that show the Yankees at Shea Stadium. There were a dozen or so 2016 Topps cards - my first ones in the set! After all the negative commentary on this set I was expecting not to like it, but in person they were quite colorful and I think they're all right. There was even one of those shiny parallel versions (I forget what they are officially called). Finally, a couple of cards that are reminiscent of when the Post and Daily News have the same headline. I think we can all agree that George Brett is one of Baseball's Best. Turned out I had both of these already - DefGav I see you collect Brett so I will put them in your trade pile unless you don't want them. There are generally only two ways I acquire baseball cards. One is trading with bloggers; the other is buying cards secondhand from garage sales, street vendors, flea markets, etc. I almost never buy cards from online retailers. I have used Amazon gift money on cards in the past, and once made a big eBay purchase as the cards were a great price. I am not the kind of person to make an impulse buy on cards (or anything else, really). But when I saw Nick's recent Dime Boxes post on the late 1980's Spokane Indians sets with photos taken at the mall, I knew I had to have them immediately. I love minor league baseball cards, I like cards with photos, and I have developed an interest in old retail, so these cards couldn't have been more in my wheelhouse. I did a little research and found a site called STB Sports which seems to carry just about every minor league team set out there, and at pretty reasonable prices - including shipping the sets came out to under $20. I was a little nervous about using a site I had never heard of but the cards were shipped quickly and with no issues. Sets like these have to be savored, so I will be showing each and every one of these cards in their own post, writing a little something about the card and the photo they are in. A couple more of my Hall of Very Good baseball card retrospectives are now up on that site. Check out Ross Grimsley and Jose Canseco. Jose's fellow bash brother, Mark McGwire is the subject of this post. Pack War had a contest recently and I was fortunate to be one of the winners, getting this cool 1997 Mark McGwire Screen Gems card. However, Corky unexpectedly threw in a bunch more cards which was a real treat. There were some more McGwire cards, including this beautiful shiny Topps Tek insert. Matt Suschak pitched in the Braves organization in 2010 and 2011. In 34 games he went 4-3 with 4 saves and a 6.36 ERA. Now an executive recruiter at Delta Diversified in Solon, OH, he kindly answered my questions about baseball cards. 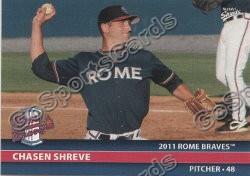 "A former teammate of mine and current Major League reliever for the New York Yankees, Chasen Shreve, had his entire set of baseball cards printed with my picture on that by mistake, in single A Rome, when in the Atlanta Braves system, hilarious!" Thanks! I don't have that card, but here is a card of him from my collection, from 2010 Bowman. The Hall of Very Good has announced it's annual inductees, and as usual I am providing baseball card retrospectives for each one. Check out the first one, for Bill Buckner, here. 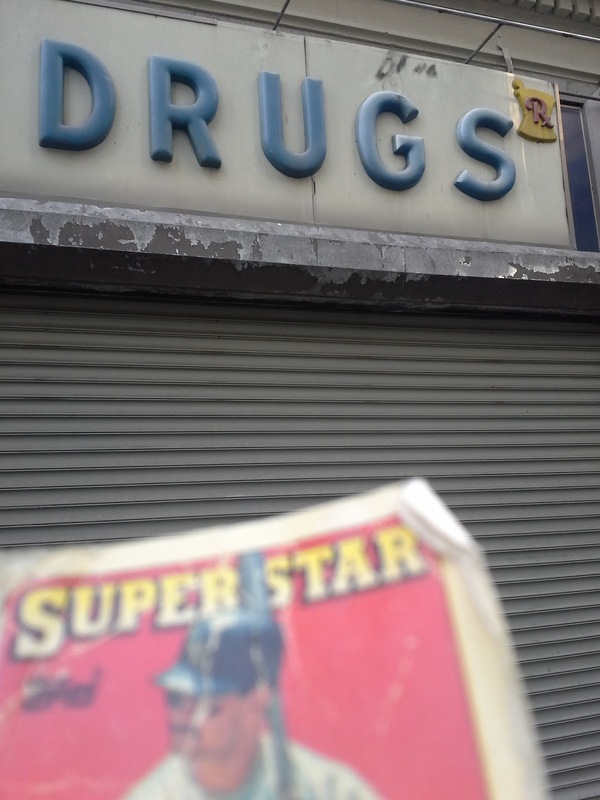 The closure of a drugstore on Broadway and 31st street has revealed an old sign for a previous drugstore. You don't see signs that look like this anymore. 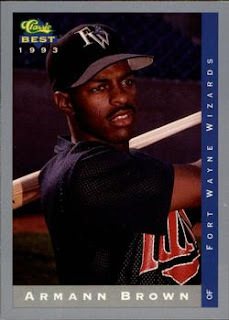 I have one card of Dana Brown, from 1991 Line Drive. 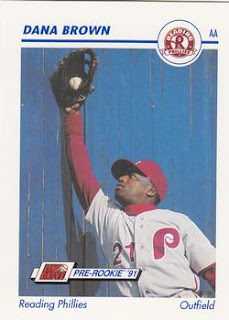 Playing career: Outfielder Dana Brown played in the Phillies organization from 1989 to 1991. In 280 games he hit .262 with 4 HR, 92 RBI and 82 SB. A fuller account of his career can be found at The Greatest 21 Days. Where he is now: Special Assistant to the General Manager for the Toronto Blue Jays, he is considered a likely future MLB general manager candidate. Google Autocomplete results: He is fifth when you type Dana Br, between Dana Brody, a TV character, and Dana Brown Vanity Fair, an articles editor. There are no entries for the ballplayer on the first page of Google results; most are for a filmmaker. Coming up next: The next profile will be Darrell Brown. 398 West Street, on the West Side Highway, has been the home to a variety of commercial tenants, mostly restaurants, over the years, but it appears to have not housed one in over a decade. Nonetheless, the sign for the West Coast Coffee Shop, which operated from 1993 to 2004, still hangs over the entrance a dozen years after the business shut down. I have 29 cards of Chris Brown. This one is from 1985 Fleer Update. Playing career: Chris Brown was a highly touted rookie in 1985 as the third baseman hit .271 with 16 HR and 61 RBI for the Giants. He followed that up with a solid 1986 (.317, 7 HR, 49 RBI) but never again came close to fulfilling the promise of his rookie year. After brief stints with the Padres and Tigers he was out of the major leagues after the 1989 season. Post-baseball career: After his playing career Brown worked in various construction jobs in Houston before joining Halliburton and serving three tours driving fuel trucks in Iraq, occasionally operating under fire, including being in a convoy that was attacked and six of his fellow drivers as well as one soldier were killed. After his third tour in Iraq Brown lost his job, and shortly after his wife and daughter moved out of his house. Facing severe financial difficulties, Brown apparently tried to burn down his house for insurance money. Brown was gravely injured in the fire and died of his injuries a few weeks later. 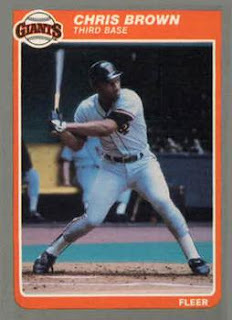 My memories: I remember him as a highly touted rookie and so always thought of him as a kind of a minor star, but with 38 home runs in 449 games he really didn’t have much of a significant career. There are no entries for the first page of Google results; all of which refer to a singer. Google Autocomplete results: He is seventh when you type Ch, between Christina Grimmie, a singer who was killed recently in Orlando, and Chrome, a Google browser. There are no entries for the first page of Google results; most refer to a singer. Coming up next: The next profile will be Dana Brown. I had never gotten a "Cardtoons" card before but there were several in this pack. The art is weird but well-executed. Great picture of a Yankee legend here. And here is an even better classic picture - Lou Gehrig jumping over a teammate's swing. I also liked this picture of Sparky Lyle in a minor-league Orioles uniform, with a bicycle in the background - I don't remember seeing a bike on a card before. Great shot of Don Mattingly. Lots of great photos of Yankee stars in this package. This may be the funniest of all - a baseball card featuring a very young Joe DiMaggio, eating spaghetti with his mom in a 1930s publicity shot. I have nineteen cards of Brant Brown. This one is from 1998 Score. 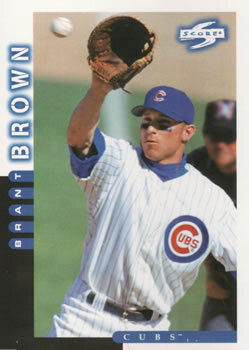 Playing career: Outfielder Brant Brown played five seasons in the major leagues, mostly for the Cubs. In 424 games he hit .247 with 45 HR and 146 RBI. My memories: He is well known for dropping a fly ball in the outfield to lose a game for the Cubs in September of 1998. At the time the Cubs were tied for the NL Wild Card with the Mets, but fortunately for Brown the Cubs managed to hold the Mets off for the last few games of the season. Where he is now: The man most famous for dropping a ball in the outfield is now the minor league outfield coordinator for the Seattle Mariners. Google Autocomplete results: He is fourth when you type Brant Br, between Brant Brooks and Brant Brooks Bear Stearns, both of which refer to an investment banker. Another prominent Brant Brown is Associate General Counsel at FINRA. Coming up next: The next profile will be Chris Brown. I was fortunate to be a winner in Baseball Card Breakdown's annual Pull-Tab Awareness Contest. Gavin sent a stuffed PWE filled with great cards. Also very cool was this 1978 Gene Tenace disk. 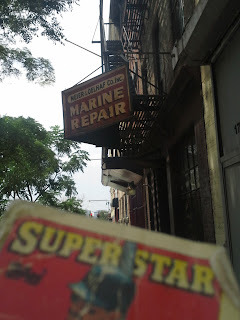 Meier & Oelhaf was a marine plumbing supplies business that operated on Christopher Street from 1909 to 1984. Despite being out of business for over 30 years, their sign still hangs above their former business at the west end of the street. I have one card of Brandon Brown, from 2012 Bowman Prospects. Playing career: Second baseman Brandon Brown played in the Mets organization from 2010 to 2012. In 178 games he hit .237 with 11 HR and 65 RBI. After the 2012 season he received a 50-game suspension for steroid use, effectively ending his career. Where he is now: Anyone know where Brandon Brown is now? Google Autocomplete results: He is fifth when you type Brandon Br, between Brandon Brooks, a guard for the Philadelphia Eagles, and Brandon Bryant, an ex-Air Force pilot. There are no references to the ballplayer on the first page of Google results; the first is for an author. Coming up next: The next profile will be Brant Brown. Let's start off with O-Pee-Chee, because this was a Canadian trade. There were lots of O-Pee-Chees, but this one was probably the best - it was the oldest, had a "traded to" designation, and that giant O-Pee-Chee logo. Nice photo of Luis Polonia drag-bunting. This is not from the base set but the update set that is considerably harder to find. Interesting composition on this photo - Slaught is sliding right out of the picture. Finally, a sparkly card. I love sparkly cards. It's been a very long time since I won a contest, and then last week I won two in one day, which was pretty exciting. It helped that there were very few entrants for either one. Daniel of It's Like Having My Own Card Shop had a contest for people who retweeted his sons' Paul Goldschmidt batting stance impressions for a contest the Diamondbacks were having. Happy to say that they did win a runner-up prize! My prize for winning was this nice selection of cards of Goldschmidt, a four-time all-star who might be the best first baseman in the majors. I have sixteen cards of Bobby Brown. This one is from 1981 Fleer. 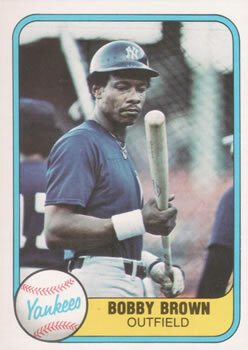 Playing career: Outfielder Bobby Brown played for the Blue Jays, Yankees, Mariners and Padres from 1979 to 1985. His best season was 1980 when he hit .260 with 14 HR and 47 RBI. Overall, in 502 games he hit .245 with 26 HR and 130 RBI. My memories: He is from before my time but I remember him as the second most prominent Bobby Brown who played for the Yankees. Where he is now: Anyone know where Bobby Brown is now? Google Autocomplete results: He is third when you type Bobby, between Bobby Shmurda, a rapper, and Bobby Cannavale, an actor. There are no entries for the first page of Google results; all of which refer to a singer. Coming up next: The next profile will be Brandon Brown. I have mentioned several times my interest in privilege signs (old signs advertising eating establishments that feature soda logos). Most of the ones still in existence today are on storefronts. However my interest in them was piqued by the many hanging signs visible in old photos and videos. 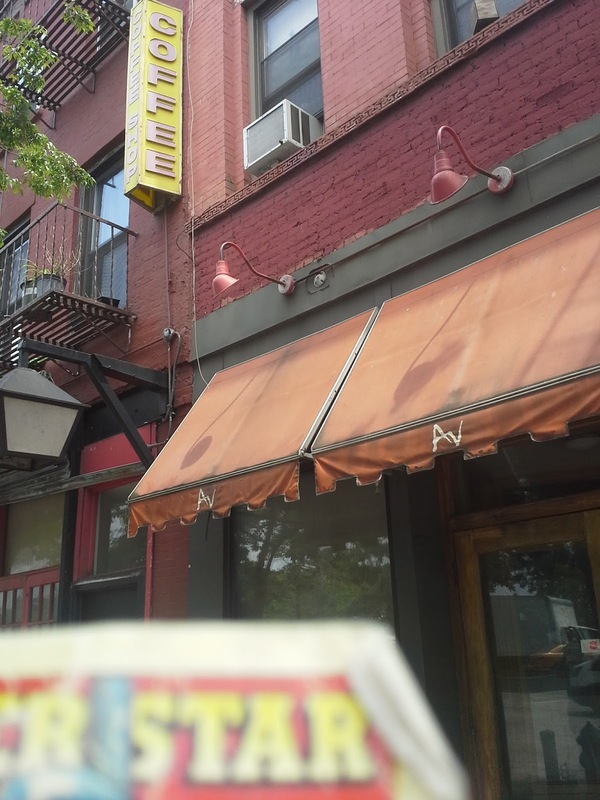 All of the originals in New York might be long gone but I found a new-looking one at a pizza place on Eighth Avenue. The Coca-Cola sign is not as prominent as it would have been on an old sign but it still counts for me. I have one card of Armann Brown, from 1993 Classic Best. Playing career: Outfielder Armann Brown played in the Twins organization from 1992 to 1997. In 353 games he hit .236 with 7 HR, 101 RBI and 91 SB. Where he is now: Area scout for the Oakland Athletics. Google Autocomplete results: He is fourth when you type Armann, between Armanni Ebstein, the name of a lesion of the kidney, and Armaan Malik, a singer. Another prominent Armann Brown is owner of MyCincyLife. Coming up next: The next profile will be Bobby Brown. Got some awesome cards in a great trade with Corky of the blog Pack War (go check out the contest he is running). It was a great, eclectic compilation of cards from all over my wantlists (particularly the funny/interesting pictures section) and beyond, including an incredible hit card that is now probably the most awesome card I own. I don't have any 2016 base cards yet, believe it or not, but I have a couple of other cards from this year now including this beautiful Gypsy Queen card of Lou Gehrig. There is something meta about signing your autograph on a picture of someone signing an autograph, as seen in this 1992 Bowman card. Of course, 1992 Bowman is famous for it's rookies in street clothes, the best of which features Cliff Floyd dunking a baseball. This is a card that should not exist - it is numbered 000/000! 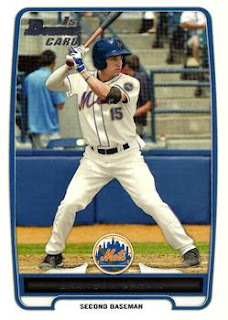 Actually all 2007 Bowman cards of Jose Reyes have this unusual error. Who is posing with Chuck Knoblauch here? I love Collectors Choice and 1998 is the only year I haven't completed. I always love these "players and kids" cards. No, that card and this one of a flying Steve Karsay are not 2016 Stadium Club, though they look like they could be, as that set stole it's design from 1997 Fleer. I wonder what kind of rodent got out onto the field to send Carlos Baerga scampering onto a chair. I like the cameo of Tommy Lasorda playing first. This pose has been done a few times in various parks, but I like the view of Chicago behind the left field wall here. Grrrr! Hulk smash! Ron Gant is a monster but this is not the monster hit at the end of the post. Finally, here it is. A Joe DiMaggio bat card! To own even a small piece of memorabilia from one of the greatest Yankees of all time is really awesome, and certainly something I never thought I would own. Thanks, Corky!